Microsoft chairman Bill Gates, the world's richest man, on Friday promised 10 billion dollars (7.2 billion euros) to develop "miracle" vaccines for the world's poorest nations. 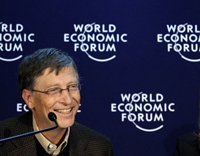 Gates announced at the World Economic Forum that the money will come over the next decade from the foundation he runs with his wife Melinda, and that vaccines will become the charity's top priority. The Bill and Melinda Gates Foundation has now committed more than 25 billion dollars to various health projects, especially targeting AIDS and polio and other diseases that hit poor countries. "We must make this the decade of vaccines," Gates said in Davos. "Vaccines already save and improve millions of lives in developing countries. Increased vaccination could save more than eight million children by 2020, he added, but called on governments and the private sector to do more. UN agencies and campaign groups welcomed Gates stunning announcement. "The Gates Foundation's commitment to vaccines is unprecedented, but needs to be matched by unprecedented action," said World Health Organisation director general Margaret Chan. "It's absolutely crucial that both governments and the private sector step up efforts to provide life-saving vaccines to children who need them most." He is in Davos as the world's leading philanthropist and his activities overshadowed those of the political and business elite at the Swiss ski resort. AFP has contributed to the report.